Emmanuel Macron is beginning on Monday his first day as French President, with picking a Prime Minister and later traveling to Germany to meet Chancellor Angela Merkel, the media reported. The Prime Minister’s appointment is crucial for Macron, who needs to do well in next month’s parliamentary elections to push through his planned economic reforms, the BBC reported. 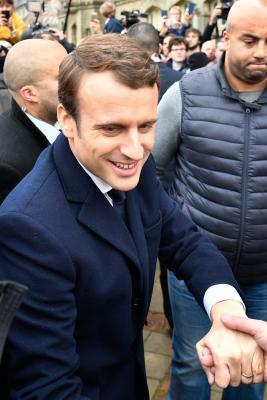 The 39-year-old former investment banker and an economy minister was inaugurated on Sunday as the 25th President of France and also the youngest in the nation’s history in a ceremony at the Élysee Palace. He promised to convince people that “the power of France is not declining — that we are on the brink of a great renaissance”. Macron’s party Le Republique en Marche has unveiled more than 400 candidates for June’s elections. Many have never held elected office before, reports the BBC. Macron was sworn-in as President after his landslide victory over far-right National Front leader Marine le Pen, with 66 percent of the vote in the run-off poll held on May 7. He had never contested an election before and only formed his centrist movement a year ago. His visit to Germany is expected to be cordial as Macron has strong pro-EU views, officials said. He has said he wants to reform the euro zone, giving it a common budget and its own finance minister, but he will need German backing.